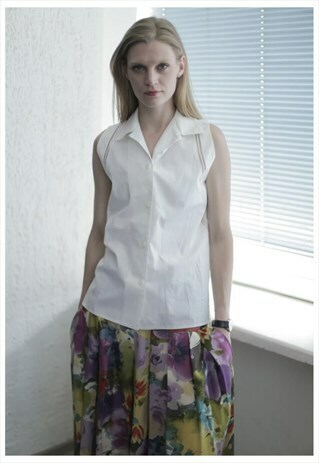 Lovely, classy vintage early 90's white sleeveless button up shirt with cut out details around arm holes. Made in Finland. 100% cotton. Uk size 12. Model size on the photo is 8. Measurements: length 25.3 inches, chest 38 inches, waist 39 inches, hips 41 inches.